Of course, it should be the FTSE rollover table we are showing you but as there is still so much more to go here in this expiry, we decided to use the more usual format. This is, naturally, being very cognisant, of the accuracy of our expiry forecast. And, on this subject, hopefully you noticed the intraday high on Monday 4th was 7046.58. And, from Tuesday onwards, courtesy of an opening jump, it was all about R3 at 7200, with intraday highs of 7180.71, 7184.22 and 7187.51. All in all, it seems a very long time ago this index was testing R1 at 6750 below the zone, but, in fact, it was just a fortnight ago, and certainly very much helped by there being no meaningful ratio from 6750 all the way up to 7050, at that time. Shame, as that was strike three on Thursday, but the siren like call of the rollover could not be ignored, and the only thing to remain unchanged in the above table is the zone. There is no doubt that this index wants to go higher, and they are certainly expending a lot of effort (and money) to try to achieve this, so, despite our lack of March’s ratio table, this should be implicitly understood, as where this market is on Wednesday will therefore dictate the rest of the week, which will naturally be an exciting expiry. We couldn’t be more pleased with our DAX forecast for this expiry, because it has played out exactly as expected. In fact, it is quite a rare thing that we have witnessed, being such a degree of divergence between this index and the FTSE. Since the DAX hit R3 at 11300 with their intraday high of 11321 back on the 25th Jan, in the first week of this expiry, it is down over 400-points, whereas the FTSE has actually risen over 300-points, from their intraday low of 6734.00, which interacted with their R1 the following Monday. Talk about asset allocation, let alone trading or arbitrage, and this would have been a fantastic expiry. The lop-sided nature of this expiry continues to redress, but as we are now into the rollover, it is more about the zone. However, it is worth noting that Y2 is now 10850 and Friday’s intraday low was 10863. Also, a look at March would be very revealing we suspect, so apologies for that. Nevertheless, please do not forget that we did point out that such was dearth of ratio here that the zone could be anywhere in the Y1 ratio bandwidth, and that it did start this expiry at 10650-10750. 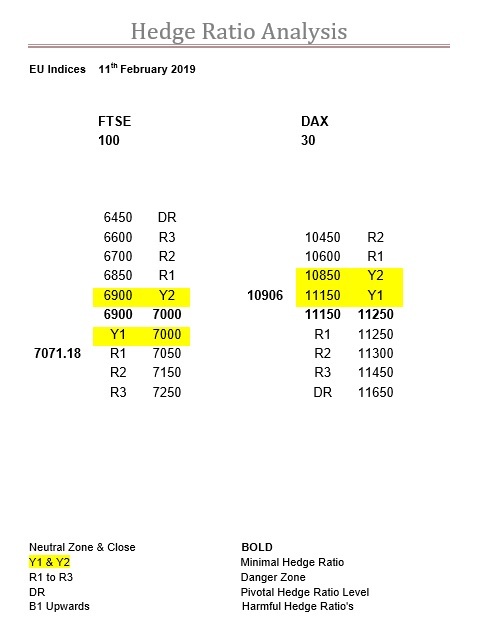 Of course, we don’t expect it to return there, especially as R1 now starts at 10600 and Y2 at 10850, but what we said at the start of this expiry still holds true today, albeit the Y1 ratio bandwidth is considerably narrower. But, please bear in mind, where it is currently, is still 300-points above where the market is currently, and yet again, in a direct contrarian aspect to the FTSE.